Expect afrobeat, kwaito, zouk, bubblegum, as well as dancehall, reggae, UK funky, jungle and more as Shadow City host a one off FREE clubnight. 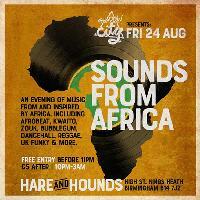 After an amazing 2017/18 season of shows featuring the likes of BICEP, Omar S, Gerd Janson, Horse Meat Disco, Call Super, Young Marco, Ross From Friends, Midland, Byron The Aquarius and more, we're delighted to end it with a night celebrating African music and African inspired music at our favourite stomping ground, Hare & Hounds Kings Heath. Expect afrobeat, kwaito, zouk, bubblegum, as well as dancehall, reggae, UK funky, jungle and more as our residents Shadow City Soundsystem and guests will take you through the evening. FREE ENTRY BEFORE 11PM / £5 THEREAFTER!